The Healthy Family is something we feel the book trade is missing. We are bombarded with all sorts of information about food and diets, but most of us who jump onto a diet trend, have spent less than a few hours finding out the details about it. Pairing up with two sports physicians Kelly Brett and George Lambrose (who are both passionate about their work when it comes to fitness and nutrition) was just the thing to take the medical gobbledygook (as Kelly says) and put it into lay man's terms. Kelly Brett M.D., a National Hockey League team physician, and his partner George Lambros M.D., sports physician, are passionate about motivating kids and families to incorporate exercise into their daily lives. They also help us understand the relationship between physical activity and the food we eat. They are the creators of CTV's Healthy Futures. The Healthy Family speaks efficiently, yet in a down home way, about all sorts of eating trends and topics so that people can spend a few minutes looking at each and understand the basics. * 20 minutes or less to prepare the whole dinner …not just the main dish! * Understand the relationship between physical activity and the foods you eat! The Healthy Family™ teaches you to create your own Eat Sheets™ using the recipes you love. The Healthy Family™, revised and updated edition, was released in 2010. 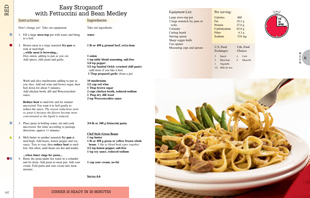 The meals are the same as the original version, but the format is changed to be like our latest books. Larger photos, a more modern look and feel , updated nutritional data and we now include the sodium content. The Healthy Family™ contains all the key components which make each of Sandi Richard's books national bestsellers. The Healthy Family™ has seven nutritionally balanced weeks of five dinners, including completed Eat Sheets™ (grocery lists) for each of these weeks (in each book and printable off our website).